Want to Volunteer at the Center? The AT&T Performing Arts Center has a volunteer staff of more than 500 people from all over the Metroplex. Volunteers generously give their time at events throughout the Center. Volunteers usher, take tickets, assist disabled patrons and serve as docents and ambassadors at events in the Winspear Opera House, Wyly Theatre, Strauss Square and the Kalita Humphreys Theater. The Volunteer Program strives to create a welcoming environment for all patrons who attend events at the Center or just want to stop in and look around. The Center’s staff strives to make the Volunteer Program an enriching experience where great relationships and friendships are made. 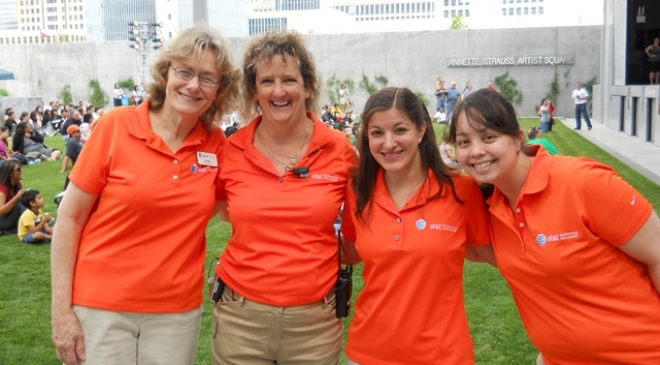 Our volunteers are a critical part of the Center and a key reason for its success!